Before we discuss the use of orthokeratology in kids’ eye care, let’s explain the basics of what it is and how it works. Typically called ortho-k, this cutting-edge treatment is an effective way for people with myopia (nearsightedness) to achieve clear vision without wearing contact lenses or eyeglasses during the daytime hours. Even after years of needing vision correction, ortho-k will allow you to leave your eyeglasses and contacts at home when you head out for the day. And this is all accomplished without a need for surgery. Our Jennersville eye doctor is experienced and skilled in fitting adults and children with ortho-k lenses. Many patients, young and older, have benefitted from the advantages of sharp vision after being fitted with orthokeratology in our office. Also called vision shaping, ortho-k involves wearing specialized hard, gas permeable lenses while you sleep. These lenses gently mold your cornea into a new shape, thereby resolving any refractive error and correcting myopia. When you wake up in the morning, you’ll be able to remove the lenses and enjoy crystal-clear eyesight. The effects generally last one to two days, so the ortho-k lenses must be inserted nightly on a regular basis. Myopia, always common in children, is an increasing problem. The number of kids who are nearsighted has grown by leaps and bounds in recent years. The reason for this remains blurry, yet one possible culprit is the increased amount of time kids spend indoors gazing at digital screens, with limited exposure to natural light. Many parents are alarmed by their child’s need for a new vision prescription yearly, and parents and kids are disturbed by the increasing thickness of their eyeglass lenses. Ortho-k offers an efficient way to slow, or possibly stop, the continued progression of nearsightedness in kids. In case you’re wondering why surgery isn’t a better option, keep in mind that laser procedures, such as LASIK, are not suitable for young children. As studies have demonstrated that orthokeratology is safe for all ages, it is currently regarded as the ideal option for myopia control in Jennersville kids. Additionally, ortho-k for kids also grants freedom to children who don’t want to be bothered by inconvenient eyewear. Frames are always falling off or being left behind, and replacement eyeglasses or repairs can run very high fees for parents. Ortho-k lenses are only worn in bed, so there’s virtually no risk of kids losing or damaging them. Regular contact lenses are often a poor choice for kids who spend a lot of their days in dusty, dirty playfields, and/or who are not able to commit to sterilizing contacts regularly. 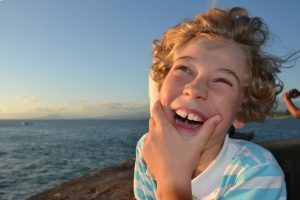 Which kids are good candidates for ortho-k? Any nearsighted child with healthy eyes is a possible candidate for orthokeratology. Regular eye exams with visual acuity testing are a necessary part of proper kids’ eye care. If your child has myopia and their vision prescription continually increases at each eye exam, ortho-k may be a good option. Our will evaluate your child’s vision and ocular condition to determine candidacy. Please contact us at Oxford Family Eyecare to schedule an appointment to discuss orthokeratology.